A row has broken out in Fiji over claims the news media may have helped cause the coup which bought down the country's government in May. As befits a small country, it quickly turned nasty, pitting David Robie, head of the University of the South Pacific's journalism programme, against the lively local media headed by the Rupert Murdoch owned Fiji Times. David Robie criticises the "distorted" PINA Nius Online December 12 report on his Journalism Education Association (JEA) conference paper "Coup Coup Land: The Press and the Putsch in Fiji", saying it relied on selective quotes, misrepresentation and failed to reveal the author. The University of the South Pacific journalism programme has won the coveted premier publication award at Australia's annual Ossie Awards - the "Walkleys" of student journalism. A former Fiji attorney-general has drawn a parallel between the Pacific nation and the United States and attacked the professor charged with heading a constitutional review. New Zealand High Commissioner Tia Barrett's comments criticising the delay in bringing people responsible for the coup and mutiny in Fiji to justice have reportedly stirred a "diplomatic incident" and a caution from the police. New Zealand High Commissioner Tia Barrett has challenged the delay in prosecuting the leaders of Fiji's coup and mutiny, saying "dictatorship, one-party states and other forms of demagogy do not belong in the Pacific". Fiji's military installed interim government plans to spend more than F$1 billion in an effort in jump-start the economy in its 20001 Budget but reaction has been mixed. A leading economist describes it as a "rich man's budget". The Fiji Labour Party, which led the coalition government ousted by coup leader George Speight, has rejected the 2001 Budget on the eve of its delivery as illegal. Deposed Prime Minister Mahendra Chaudhry says the Fiji economy has been shattered by the coup with tax evasion now rampant. A Fiji Visitors Bureau television advertisement portraying the Fiji Islands as unchanged after rioting and a coup in May has been found to have breached New Zealand's advertising code of ethics and has been modified. "The Fiji experience turned into a long and rugged experience for me...although plainly not nearly so rugged as it was for the hostages or, for that matter, the people of Fiji. But by my last familiar drive from Nadi to Suva I found myself yearning for it to all end. Sadly that has yet to happen and now thanks to your chairman I find myself here speaking about it to the NZ/Fiji Business Council." A Fiji Islands pro-democracy group has called on the military installed interim administration to be ready to resign and make way for the formation of a government of national unity following the landmark court ruling that the 1997 constitution is still valid. In a landmark judgement in the Fiji High Court in Lautoka, Justice Anthony Gates has ruled in a human rights case brought by a refugee Indo-Fijian farmer that the 1997 Constitution is still valid and the interim regime installed by the military after the May coup is illegal. Fiji Television is defying a directive by the military installed interim administration to provide live broadcast coverage on today's title defence by world heavyweight boxing champion Lennox Lewis against Pacific challenger David Tua on the free-to-air channel. The Fiji Human Rights Commission has confirmed that it has the powers to investigate the Fiji Military Forces for alleged violations during the November 2 mutiny, according to the Fiji Sun. Fundamental human rights guaranteed in international law and Fiji military decrees issued after a coup in May appear to have been violated by military and prison authorities in Fiji; at least nine people were killed and 30 injured, and relatives have been denied access to many of those injured. Legislation aimed at prosecuting those who campaign for trade and economic sanctions against Fiji is expected to be ready in this Pacific island nation next week, reports Pacnews. Gagging orders against Fiji military suspects based on hearsay allegations were today condemned by the Fiji Times, which warned army authorities against turning the country into a dictatorship. The efforts by the West Papuan people to garner international support for self-determination have taken a number of leaps forward recently. But despite growing international concern at Indonesia's repressive policies in West Papua - including a ban on raising the Morning Star flag of independence - the two major parties in Australia are primarily concerned about improving relations with Jakarta. Companies operating in the oil and natural gas rich Timor Gap include some of the largest multinational and Australian-based energy corporations. Anglo-Dutch giant Shell, US-based Phillips Petroleum and Australian players such as Woodside Energy and Santos stand to make huge profits from oil and gas reserves that rightfully belong to the long-suffering people of East Timor. Editorial: The deadly November 2 firefight between rival factions of the Fiji armed forces has again revealed the true source of "regional instability", and the greatest threat to human rights and democracy, in the South Pacific: the privileged neo-colonial capitalist elites that have been assiduously cultivated over many decades by the region's most significant resident imperialist power, Australia. News media have reported two senior Fiji military officers are under house arrest but one, a high-flying colonel, denies this and the military have now said the men are held under "restricted movement". Two top military officers in Fiji have been placed under de facto house arrest following an attempted mutiny, reports say. Execution-style killings of unarmed Fijian soldiers during last week's mutiny have led to bitterness and tension in the military, reports the Fiji Times. And the newspaper says in an editorial a "tale of horror" had taken place in a military force known around the world for its integrity and honour. The failed mutiny by the elite Counter Revolutionary Warfare Unit (CRW) on 2 November 2000 was not surprising. It was an inevitable development from the "unfinished business" of May 19. The complex issues behind the "big bang". Three members of Fiji's Great Council of Chiefs and a senior army officer have been identified by a wounded rebel as the masterminds behind Thursday's mutiny against military chief Commodore Frank Bainimarama, according to the Sunday Post. Most of the dead in Fiji's military mutiny have been beaten to death by loyal soldiers after their surrender, a highly placed official source says. Fiji's Human Rights Commission has promised to carry out a full investigation into the deaths of rebel soldiers and of prison escapee Alifereti Nimacere in the mutiny and subsequent military manhunt. Papua New Guinea Prime Minister Sir Mekere Morauta sacks his deputy and five ministers, accusing them of leading a cabinet revolt against him. Student journalists graduating from Pacific universities are being paid far lower than other starting media graduates in the region. And many media industry people believe starting rates should be higher with "career path" structures as in other countries such as Australia and New Zealand. The future of the media industry backed Fiji Journalism Institute (FJI) is reported to be in limbo in the wake of financial problems. In October, the institute was evicted from its office and a scathing Fiji Times editorial called for it to "clean up the mess". Notorious prison fugitive Alifereti Nimacere has died after being captured by Fiji military forces hunting rebel soldiers on the run after Thursday's mutiny, military authorities confirm. Loyalist Fiji troops search bush areas in the suburbs of the capital of Suva for renegade special force soldiers who failed to kidnap the military commander in a mutiny in the main barracks. When Pacific Island Forum leaders agreed on a staged process of action against any future threats to democracy in the region, they hardly expected the first test to start shaping up within a week. Fiji's capital Suva has been shut down, as the military tries to capture the remaining elements of the specialist military unit that staged a mutiny. Profiling the rich diversity of Oceania and providing comprehensive web coverage of the 8th Festival of Pacific Arts from New Caledonia. arTok aims to bring this event closer to auduences around the region and around the world. It's about time the Pacific Islands News Association secretariat in Suva has a rethink - and takes a more global and even-handed view about media freedom issues, rather than expedient parochialism. Diversity and plurality is the way forward in the Pacific. PINA should encourage this, not stifle it. Freelance journalist Duran Angiki who was allegedly threatened over his reporting of the Solomon Islands crisis launched into a journalism career almost by accident. Agence France-Presse journalist Michael Field, the man who has been barred from more Pacific countries than anybody else, speaks out on the Kiribati ban. Newspapers, media executives and media freedom groups have condemned the detention by Fiji's military forces of three Radio Fiji staff over a news story as intimidation of the country's news media. Fiji's military installed interim administration has tried to gag a popular Fiji Television current affairs programme over a planned interview with the deposed elected prime minister of the country, reports one of the country's daily newspapers. Church leaders and human rights activists in Indonesia's eastern province of Papua, formerly known as Irian Jaya, have reported a build-up of troops, which they fear will be used to crackdown on separatist supporters. A satirical news piece on Fiji news media carelessness and trivia - and why journos should be formally trained. The widow of one of five Australian journalists killed in East Timor in 1975 has renewed calls for an inquiry into their deaths, saying she had statements from new witnesses. Warring Solomon Islands militia groups have signed a breakthrough peace agreement aimed at ending the two-year ethnic conflict that has pushed the South Pacific nation to the brink of disintegration. A prominent Indo-Fijian political leader has accused four Indians who have agreed to serve on Fiji's controversial Constitutional Review Commission as having betrayed the Indian community "at the most crucial hour". The commission is widely dismissed as a farce and a charade. Many groups, including Amnesty International, Reporters Sans Frontieres and Pacific Media Watch, have reported the alleged threats against independent Solomon Islands journalist Duran Angiki, 32, over an article he wrote about alleged government payments to a militia leader and a deadline of one week for an "apology". Malaita Eagle Force spokesman Andrew Nori has denied this in a media conference. Angiki makes a public statement that is gagged. The Fiji Islands Media Association has appealed to the Information Ministry for help after being ordered to vacate its Fiji Journalism Institute office in suburban Suva amid controversy over its finances, according to media reports. The Fiji Times also called in an editorial for the association, a Pacific Islands News Association (PINA) affiliate, to "clean up its mess". The Fiji Islands High Court has overturned a ruling by the Magistrates Court which set free a rebel who had been charged with three counts of attempted murder, including one against a British television journalist during the May insurrection, according to news reports. This has major implications for the treason charges against coup plotter George Speight and his rebels. A retired newspaper publisher and the opposition party defeated in Fiji's 1999 general election and implicated in the May insurrection have independently called for treason charges against deposed elected Prime Minister Mahendra Chaudhry for campaigning internationally for a quick restoration of democracy. Sir Leonard Usher, a former publisher of The Fiji Times and a life member of the Pacific Islands News Association (PINA), has made his call in a rhetorical letter to the editor in the Daily Post. An international news agency and world media freedom and human rights groups have hightlighted reports that a Solomon Islands journalist is in grave danger from a militant group which has seized the country's government. Amnesty International, the Paris-based Reporters Sans Frontieres and Sydney-based Pacific Media Watch are among groups which have protested to the Solomon Islands Government about the threats and appealed for a guarantee of safety for Angiki and his family. Heroes and villains. Over the past four months the Fiji Islands has suffered from an overdose of villains. But genuine heroes were rare, apart from the hostages themselves and some civil society hardy souls - such as in the Red Cross. And some media heroes. Fiji's acting Police Commissioner Moses Driver has confirmed police are investigating a controversial letter published in the Fiji Times daily newspaper purporting to threaten pro-democracy advocates in the country, according to news reports. The South Pacific's island nations have issued a veiled warning for Australia and New Zealand to stay out of the affairs of Fiji and the Solomon Islands before Prime Minister John Howard's planned attendance at the South Pacific Forum's in Kiribati on October 27-30. Article 19, the Global Campaign for Free Expression, has a new website: http://www.article19.org. Easy to navigate and fully searchable, the site includes hundreds of documents and links covering freedom of expression issues across the world. Fiji businesses ruined by looting and arson in the May insurrection are keeping a hopeful eye on a new test insurance case as they push for assistance in rebuilding a shattered economy. Two lawsuits involving F$2 million have been filed over the May 19 rioting as Indo-Fijian leaders have defiantly rejected any review of the 1997 multiracial constitution. Behind the cries for ethnic solidarity and indigenous Fijian supremacy was a struggle over land, money and mahogany, a competition that involved American and British as well as local business interests. Fiji's mahogany helped prompt a struggle for political power, inflicting damage to the nation's economy and political system well in excess of the riches the commodity once promised. Fiji's Daily Post has condemned Information Minister Ratu Inoke Kubuabola for his attack on a visiting Australian trade unionist and told him to "get real" over the country's political crisis. The Australian Government is cautiously optimistic that talks between the leaders of Papua New Guinea and Bougainville will provide a lasting settlement for long-running tensions on the island and lead to a phase-out of the largely Australian Peace Monitoring Group there. His childhood was spent in the West Papuan jungle, where his family had fled an invading army. By the age of 11 he was leading a unit of independence guerrillas. He endured a decade in Indonesian prisons until a miraculous escape to Australia a year ago today, on the plane that brought Bishop Carlos Belo to safety. Jacob Rumbiak has a story to tell. A profile on the BBC World's Tim Sebastian interview with deposed Fiji Prime Minister Mahendra Chaudhry and the reaction. Members of rival armed groups and the police responsible for unlawful killings, torture and abductions must be brought to justice if current peace efforts are to have a lasting effect, Amnesty International says releasing a new report. Three ministers in Fiji's military-backed interim administration have been implicated in an alleged conspiracy to illegally overthrow the People's Coalition government of deposed Prime Minister Mahendra Chaudhry. It took all the professional skills of India's Ministry of External Affairs to carefully manage the recent 10-day visit of deposed Fijian Prime Minister Mahendra Chaudhry to India. The decision to go to India was not accidental. The issue of whether Fiji coup leader George Speight and his rebel group charged with treason are covered under the Immunity Decree 2000 for their rebellion has been referred to the High Court. One year after pro-Indonesia militias, backed by the Indonesian army, killed, burned and looted their way across East Timor in response to the 30 August 1999, referendum on independence, not a single perpetrator of those crimes has been brought to trial. Fiji Television journalist Riyaz Sayed-Khaiyum believes ousted Prime Minister Mahendra Chaudhry lost the "propaganda war" over the recent Fiji political crisis, saying the deposed Labour Party-led coalition government failed to communicate its policies to the public. The Fiji Islands are suffering a brain drain amid calls for investigation into Speight's furtive support. A new intelligence unit will soon be established by Fiji's interim administration, says the interim Home Affairs Minister Ratu Talemo Ratakele. Fiji's military-backed interim government has granted a work permit to the expatriate editor-in-chief of the newspaper suspected by the deposed elected government as having mounted a campaign against it, according to local news reports. A minister in Fiji's deposed elected government has accused the Fiji Times for plotting against the Chaudhry government in a widely circulated email message. Fiji's Police Commissioner Isikia Savua was today likened by a newspaper to a Phantom or a Batman in his fight against the country's crime, then entered rebel George Speight and "the worst crime of the millennium". The Solomon Islands' government has appointed a new police commissioner to replace the expatriate holder of the post. .
Fiji's deposed Agriculture, Fisheries and Lands Minister Poseci Bune today implicated several political personalities as players in the May insurrection and claimed that George Speight was not the real rebel leader. A mood is developing in the Western Solomons for the new state to declare political independence from the rest of Solomon Islands. Members of the ousted government have filed a writ against the president, former president, armed forces chief and the military-backed interim administration alleging wrongful dismissal following the May insurrection. Fiji's new rulers hope their hasty Budget will dull the pain for island businesses. When George Speight launched a coup in Fiji, journalism students at the University of the South Pacific suddenly found themselves on the front line. Chistine Gounder, final-year student and editor of the school's online news service, explains how she and her colleagues grabbed the opportunity of a lifetime and David Robie backgrounds the programme. Crowd supports rebel frontman George Speight and company as they appear in court on initial charges over insurrection - and are remanded back to their makeshift island prison off Suva Point. The Fijian crisis is not about the rights of ordinary people, says veteran Pacific affairs journalist David Robie, it is about 'a Third World oligarchy which has failed its people'. Two island nations in the Pacific are in the grip of coups by indigenous groups. Who's next? One of two indigenous deputy prime ministers in the ousted elected Fiji people's coalition government has condemned the swearing in of the new interim administration as an action outside the 1997 democratic constitution. Fiji military forces have stormed the rebel lair at a school on the outskirts of Suva and seized leaders of the insurrection in what the army described as a "mopping up" operation. The military have not rule out treason charges against rebel leader George Speight and his ringleaders. Fiji's descrated Parliament has been dubbed the "house of evil" in a banner headline in the Daily Post and reporters say used condoms and women's undergarments have been strewn throughout its offices. FIJI: Analysis: THE FAILURE OF LIBERAL DEMOCRACY? A response to Dr Robert Wolfgramm of Monash University published in Fiji's Daily Post on July 15. This article was published in the Daily Post on July 27. One of the ironies of embattled Fiji is that today - July 24 - is Constitution Day. But there is no constitution - the multiracial document was abrogated by decree by the then military regime on May 30 at the start of martial law. A question for you from Fiji. There's a special prize. Who said: "We don't care about the modern world, we don't have to abide by what the modern world wants. It is right for the Fijians."? Shirley Shackleton, the wife of one of the journalists murdered at Balibo in 1975, unravels the lies by officialdom over the tragedy after reading a new book, listening to interviews and speaking with the authors. Myth making continues in Fiji as supporters of rebel George Speight find all sorts of reasons to justify the illegal acts of 19 May 2000. While the takeover was portrayed as a nationalist takeover of an Indo-Fijian dominated government, the real reason was internal power struggles within indigenous Fijian clans. The Committee to Protect Journalists (CPJ) has condemned recent attacks by forces under the control of rebel leader George Speight and called on the coup leader to respect the right of the press to work freely. Thousands have died in the Moluccas in what seems to be a religious war betweden Christians and Muslims. Despite the state of 'civilian emergency' decreed by President Wahid, killings have still continued. This article dissects the forces that are behind the violence. A review of the paradoxes and dilemmas of the past two months of Fiji's hostage and political crisis. How an American professor in graphics design helped Wansolwara newspaper beat an attempted gag to prevent its special edition of the Fiji crisis reaching the Pacific university community and general public. An interview with the Cafe Pacific publisher who was one of the keynote speakers at the Australia and New Zealand Communication Association conference in Ballina, New South Wales, on July 3-5. Some reporters and news organisations were too ready to give legitimacy to George Speight's "two bit" rebellion. The Fiji print media in particular failed to give insightful and critical analysis. The Solomon Islands' former Prime Minister, Bartholomew Ulufa'alu, has been beaten and forced to pay $2000 compensation to the Malaitan Eagle Force before fleeing the country's capital, Honiara. 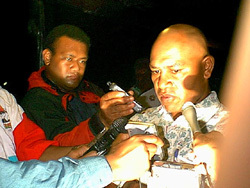 The third (attempted) coup in the Fiji Islands in 13 years led to an extraordinary symbiotic relationship between the terrorist leader, failed businessman George Speight, and the news media. Small nations in the Pacific are looking to their constitutions - and examining their flaws - as critics seek answers to the so-called "coup virus" in Melanesian countries and look for long-term solutions. he Suva shopping centre is becoming a city of wired net windows. The new protection is ugly, but effective. Shop windows look unappetising. Even when peering through the badly welded iron crisscross grids, it is almost impossible to see anything in the shop windows. Usually there is nothing to see. Pacific Journalism Online, the website of the journalism programme of the regional University of the South Pacific, has reopened in cyberspace after university authorities decided to lift the suspension which had been imposed on May 29 for security reasons. Virmati Chaudhry, wife of Fiji's democratically elected prime minister Mahendra Chaudhry, waited yesterday in vain for her husband to be set free. And she also waited the day before in disappointment..
Fiji's political impasse has taken another twist after days of on-off talks with the military opting in frustration with the rebels to run the country for the next two years. 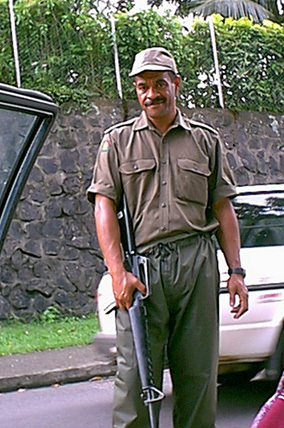 A Fijian soldier at a roadblock. The blame for Fiji's troubles must be put squarely on those who conducted the coup and those who are supporting or accommodating them, not on those who are supporting bans or the like, for such strong measures are definitely necessary. If for any reasons indigenous Fijians were unhappy with the Mahendra Chaudhry government, then they certainly should have waited and voted as a bloc and defeated Chaudhry in the general elections of 2004. A group of people with guns cannot determine constitution, order and government in any society - let alone Fiji. It is therefore imperative that the hijackers are condemned by all Fijians. The Pacific Islands News Association has been bitterly attacked in the letters column of the Fiji Sun for its alleged "silence" over violations of media freedom by rebel leader George Speight and his supporters during the month-old Fiji political crisis. FIJI: CHRISTIAN CONCERN OR COMPLICITY? The Fiji military has appealed to the churches and the chiefs to put pressure on rebel leader George Speight to release the hostages. How the church and the chiefs of Fiji are handling this crisis will have long term effects on the behaviour of not only Fijians but future generations of Pacific Islanders. A leisurely look around the ravaged central business area of Suva, as Fiji (fast becoming a Commonwealth pariah) celebrates the birthday of Queen Elizabeth II, the Head of the Commonwealth and discovers a siege city under army control with a nightly curfew and gun-toting soldiers at dozens of checkpoints. Despite belated appeals for Fiji's church parishioners to refuse support to rebel leader George Speight, there are mixed messages coming from the Methodist Church, which may be giving tacit support for calls for a Christian state. New Zealand has banned Fiji rebel leader George Speight and 84 of his known associates, calling them terrorists. For a journalism student working at state-owned Radio Fiji, it was the scoop of a lifetime. Tamani Nair was in the newsroom, listening to a live broadcast from Fiji�s Parliament when the proceedings suddenly were interrupted by shouting and gunshots. Fiji's third coup was on. The Indo-Fijian villagers of Muaniweni have been terrorised and beaten by masked men from the village of Muamua in the Fiji Islands. Local police, media and army have failed to protect them. Helped by donations from a Suva-based group of humanitarians, they have decided to flee their homes. A journalist joins them on their flight to safety. Fiji, like many small nations emerging from the ashes of poverty and colonialism, was an accident waiting to happen. It also occurs at a time when U.S. policy emphasises trade and open markets over the development of democratic institutions. The daughter of a captive Fijian MP is helping lead a silent revolution on the lapels of the people of Suva. Anna Padarath and a network of supporters are wearing blue ribbons as a silent protest at the actions of coup leader George Speight and his gunmen. Wansolwara, the award-winning University of the South Pacific journalism training newspaper, has been published in defiance of campus authorities seeking to ban distribution of its latest edition. The two-year-old online edition of the newspaper had been curbed when authorities disconnected the journalism programme's main website Pacific Journalism Online on 29 May 2000 over Fiji political crisis coverage. The hijacking of an elected government by sectional interest in Fiji does not come as a surprise, since plans have been in progress for a year to undermine Prime Minister Mahendra Chaudhry, who seemingly fell out of favour with Fiji's elite power brokers. The vote sweeping the Chaudhry government to power in May 1999 was not so much a rejection of the Rabuka-Reddy compromise as against Rabuka himself, the original coup master. Fiji is suffering from George Speight's armed coup. 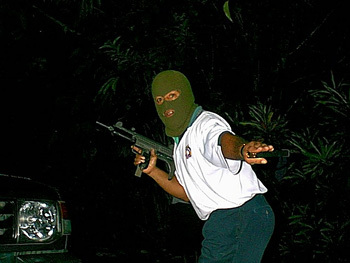 Masked men have terrorised villagers, chasing them from their homes. But while the television cameras focus on Speight and his policies of racial division, the villagers of Savu offer a glimmer of hope. . The "parachute journalists" no longer have it their way alone. The Internet has changed all that. Sites such as FijiLive and Pacific Journalism Online not only provide up-to-the-minute news items on the crisis, they carry in-depth pieces of analysis by people who know what they are talking about. Less than four weeks ago Suva's streets were packed with backpackers, tourists and locals looking to be entertained. People strolled around, throwing the big smiles Fiji is famous for. Small groups of contented friends leaned on corners, eating and chatting. Shoe-shine boys hassled to clean shoes. For the moment all that's a distant memory - Fiji's relaxed atmosphere has been scared underground and replaced with scared glances and a rush for passports. Former President Suharto has lost his first legal battle after his fall from power when his multi-billion dollar libel suit against Time magazine was thrown out by a Jakarta court. Central Jakarta District Judge Sihol Sitompul ruled that the US$27-billion defamation suit against the US magazine could not be accepted for lack of supporting evidence. A Solomon Islands academic at the University of the South Pacific backgrounds the socio-economic issues, going back to pre-colonial rule in the Solomons and after the country's independence in 1978, to explain the current attempted coup. In terms of the 1997 Fiji Constitution, the actions - taken by the former President Ratu Mara and those taken by the new military ruler Commodore Frank Banimarama in relation to the administration of Fiji - have amounted to usurpations of power in both cases. Background to the legal debate. 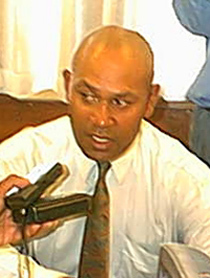 Fiji's rebel leader George Speight had a charming time with the media in the first couple of weeks of the insurrection. For some in the media, it didn't seem to dawn on them that they were dealing with a terrorist and a regime that had no legitimacy. A special edition with stories and pictures devoted to the Fiji hostage and political crisis, and an INSIGHT REPORT on environmental issues . Pacific Journalism Online, the website of the Journalism Programme at the University of the South Pacific, has been "unplugged" by university authorities for "security reasons". The University of Technology, Sydney's Department of Social Communication and Journalism (Australia) has hosted a new site for Pacific Journalism Online to enable student journalists' work on the Fiji hostage crisis to be published. Mara Fulmer's Looking Glass website (US) is hosting a mirror for Wansolwara Online (a subsite on PJO). Because of the gagged website, some of the links on Cafe Pacific may no longer work. The transcript of the controversial Fiji Television "Close-Up" programme panel discussion which led to a mob of coup leader George Speight's supporters leading an assault on the offices which cut transmission for almost two days. "Those who support Speight's coup are willing to have Fiji become an international pariah state and an economic basket case just so they can become members of an interim government. The members of these Fijian parties have no respect for the 1997 Constitution and the government that was democratically elected under it. They preferred its destruction through illegal means. Why then should they remain parliamentarians?" FIJI: HOW DO YOU NEGOTIATE WITH A PSYCHOPATH? "The dilemma faced by Fiji's chiefs is particularly unpleasant. On the one hand they could agree to rebel leader George Speight's demands and ensure that Fiji becomes once again completely isolated in the international sphere - probably destroying its already weak economic base and isolating it on the Rugby field. On the other hand they can stand up to Speight and risk turning what is already a disaster into a massacre with friends and family potentially on the shooting block." As the political crisis in Fiji twisted and turned on an almost daily basis following the seizure of the prime minister and a group of other parliamentarian hostages, a pre-coup controversy over millions of dollars' worth of mahogany was forgotten. The timber dispute that is behind the crisis. While most students at the University of the South Pacific rushed home for safety on the day of the takeover of Fiji's elected government by George Speight and his gunmen, student journalists chose to be on the job. With Fiji's telephone communications sabotaged by a rebel sympathiser, for two days the world depended on four websites for digital pictures and news updates of the hostage crisis. And the armed seizure of the Prime Minister and Parliament was scooped by a student journalist. The leader of the kidnappers holding the Fiji Islands government captive in Parliament has been branded as a terrorist by both the Pacific country's president and the leading daily newspaper Fiji Times. But just four days ago he was a local businessman with a modest profile and reputedly an undischarged bankrupt. The problem with prevailing analyses of the political situation in Fiji is the notion that the conflict is between indigenous Fijians and Indo-Fijians. The "race" card is misleading and mischievous, and unfortunately, Mahendra Chaudhry, Fiji's first Indo-Fijian prime minister played right into it with his abrasive leadership style. . The media has another indigenous whipping boy, and most reportage and comments is of course against the Fijians, and synmpathetic to Indian Fijians. Ten government ministers and backbench MPs held hostage by armed gunmen in Fiji's Parliament in a self-styled "civil coup" were freed early today after being forced to resign from office. They included Assistant Information Minister Lekh Ram Vayeshnoi and Assistant Housing and Transport Minister John Ali. Civilian gunmen leader George Speight has defied mounting international condemnation of the kidnapping of Fiji's elected cabinet, claiming that his regime is now the legal government of the Pacific nation.